We operate within wakefield and the surrounding areas serving both domestic and commercial customers with a regular window cleaning service. Thompson cleaning uses the latest water fed pole technology to clean windows in wakefield and surrounding areas. We are a fully insured and trained company who meet all health and safety standards. Having your windows washed by us ensures your home looks its best all year round. Glass is cleaned along with the frames and we are both outdoor window cleaners and internal window cleaners. 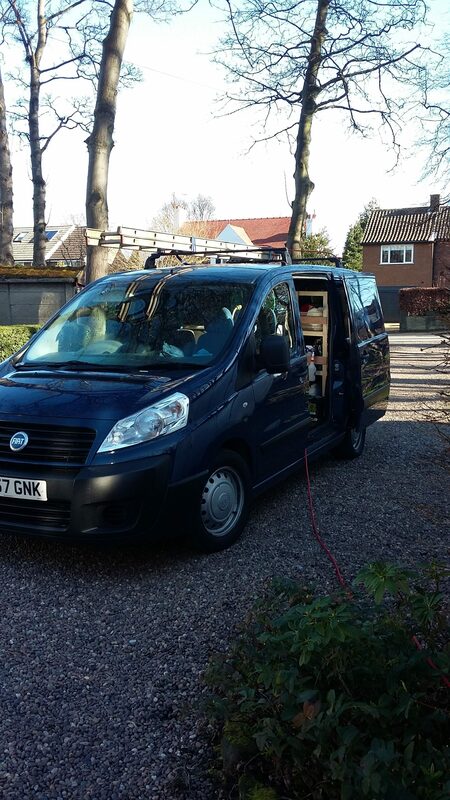 If you are looking for the best window cleaning service in wakefield, look no further…. If your windows have not been cleaned for a long time they are usually very dirty, as you can imagine they will take much longer to clean. For this reason if you are wanting a one off service we generally charge extra, however if you are intending on being a regular customer we waive this charge. We offer both 4 and 8 weekly cleans, which one you choose is entirely up to you, we find that both these frequencys are popular for various reasons, it can depend on how dirty your windows get with traffic etc. 8 weekly tends to work out cheaper over the year but may not be enough for some people. We will clean your property every 4 or 8 weeks as requested by yourself, however we dont work on set days and clean at any day during the scheduled week. the reason for this is due to delays such as the weather and the nature of the business it is impossible to predict exact days. What we can do is take a contact number and send you a text message the day before we are due if you require, this can be to unlock any gates or simply notify you if want to know when we will be on your property. for the vast majority of our customers however we simply turn up, do the job and post you a note. Payments – we do not collect ! Ways to pay are numerous, the most important point to note is that we do not collect on an evening. Online payments however is how 90% of our customers pay, simply via bank transfer, paypal or GoCardless our direct debit scheme. Details of online payments are left on our slips we post when your property has been cleaned. Please dont hesitate to contact us if you have any queries or take a look at our FAQ on window cleaning in wakefield below. Professional window cleaner services in wakefield including residential window cleaning and commercial window cleaning, areas covered include Outwood, Stanley, Wrenthorpe, Alvethorpe, Horbury, Ossett, Thornes, Sandal, Walton, Crofton, Altofts, Normanton and more. Adam has been cleaning our windows for 2 years now and its always a great job. We also use Thompson cleaning for our yearly conservatory and gutter cleaning and the service is always top notch. Our windows and upvc has never looked cleaner. Adam calls promptly ever 4 weeks and does a great job everytime, whats more he offers direct debit payments so i never have to worry about having the cash on me unlike previous cleaners we have had. A lot of our services cover the entire Leeds and Wakefield postcodes, however for window cleaning we operate in a tighter area, mainly covering Wakefield and a few South Leeds postcodes. Please click here for a comprehensive list of areas covered. How can we pay? can you not collect on an evening? Firstly we do not collect on an evening at all. The reason being are that it adds a significant time and cost to the business to do so, a cost that we would have to pass on the customer. A lot of people are difficult to catch in and more and more these days do not carry cash so it can be a frustrating exercise for us. For the customer it can be intrusive to have someone call round unannounced on an evening not to mention can feel a little uncomfortable if you have no money on you and you have to turn us away. That said we offer a rang of payments, form cash or cheque on the day, cash or cheque left out somewhere safe, cash or cheque to be posted to us, pay online via bank transfer, direct debit, standing order or paypal. So there is sure to be a method that best suits you. If you have a locked gate its very simple, we can text you the night before to leave the gate unlocked the following day allowing us to clean.. If we turn up to a property and are unable to get access to the back we will clean the front only and charge accordingly. Same with holidays just let us know you are going away and we will clean the front only. How does water fed pole work? Essentially the water fed pole comprises of long pole made of either carbon fibre, glass fibre or aluminium. Pole can be take apart (modular) or telescopic in design. Most domestic and commercial window cleaners will use telescopic poles when cleaning homes, houses and residential properties. Modular poles tend to only be use on extremely tall buildings, that is because a modular pole can be made stiffer so easier to use in wind and rain. Here at thompson window cleaning we use carbon fibre poles. These are the most expensive but they are also the lightest poles on the market which makes them more effective at cleaning your windows and allows our backs to not ache so much. On top of the pole is a brush, brushes come in many sizes and shapes, with a range of bristles from soft to hard and everything in between. Brush choice is determined by types of windows such as georgian, uPVC frames and commercial windows etc. We also choose different brushes for fascia, soffit and gutter cleaning purposes. But for general window cleaning we use an all round brush that has a balance of scrubbing power and weight ratio to allow us t clean your windows to a high standard without damaging anything. To provide water to the window a hose is run internally along the poles length to the brush head. The brush head has two “jets” which can vary in diameter form 1mm to 3mm. Bigger jets allow more water to hit the glass allowing for a faster rinse but the downside is it uses more water which we carry on our van. Window cleaning is made easier with bigger jets as small jets can create too much pressure onto the glass which results in “backsplash” which can fire water in every direction. Hoses we use ar 11m O.D and 6mm internal diameter, these anre generally 100 metres in length allowing us to reach a fair distance to the property to the van. The small diameter of hose makes them fairly lightweight when cleaning windows all day long. To provide water to the hose we have a 500l tank of water on the van, this is then pumped out of the van via a pump situated in the van. The pump is supplied with power from a leisure battery that is designed for caravans not cleaning windows. Pure or “purified” water is called such as we remove all of the natural minerals and solids along with some chemicals etc found in tap water. Pure water is obtained by process of reverse osmosis and De-ionization. The process is too complex to describe here but essentially we can find about 200PPM or 200 parts per million of solids in our water in the wakefield and leeds areas. This amount of solids is no good for cleaning windows as it would leave marks and smears on the glass. Window cleaners will look to get that TDS reading (total dissolved solids) to as close to 000 PPM as possible. We only use water that has a readinig of 000PPM.